There are very few wartime tests of the efficacy of Pugliese TDS used on board the Littorio class BBs and, with a less optimal implementation, on the rebuilt Giulio Cesare and Andrea Doria classes. RN Littorio, November 12th, 1940 at Taranto: 1 Mark XII torpedo hit, between the two MCG turrets. Damage: a 10*7,5m hole to external hull, non significant leaks to the protected zones. Repairs in drydock due to this hit and two more significant ones at the stern and at the bow, outside the Pugliese system, started on December, 11th and ended March, 19th, 1941. Further works continued for some weeks. RN Littorio, September 9th 1943, Golfo dell’Asinara: German PC 1400 X: the bomb went trough the ship and exploded 6 meters for the keel. Pugliese cylinder inside the bulges N° 2 and 4 were compressed. 1066 ton of water flooded the bulges, no leak in the protected areas. Damage not fully repaired up the ship’s scrapping after the war. RN Vittorio Veneto, December 28th 1941, Operation “M 41”: Mark VIII torpedo hit launched by HMS Urge, under the stern MCG turret. Explosion was not entirely adsorbed by the system and the ship took 3000 tons of water on board. One longitudinal bulkhead failed. The ship was able to steam at 23,5 knots. Repairs started on January, 1st, 1942 and ended March, 4th, 1942. A lesser known episode is the damage to RN Giulio Cesare in Naples, on January 8th, 1941 due to a 250 kg. British bomb detonating 4 m. from the hull, in correspondence of the forward engine rooms. Damage was examined by General (NC) Pugliese and General (NC) Rotundi. A hole about 12 square meters in the bulkhead was present, 4,5 meters below the waterline. 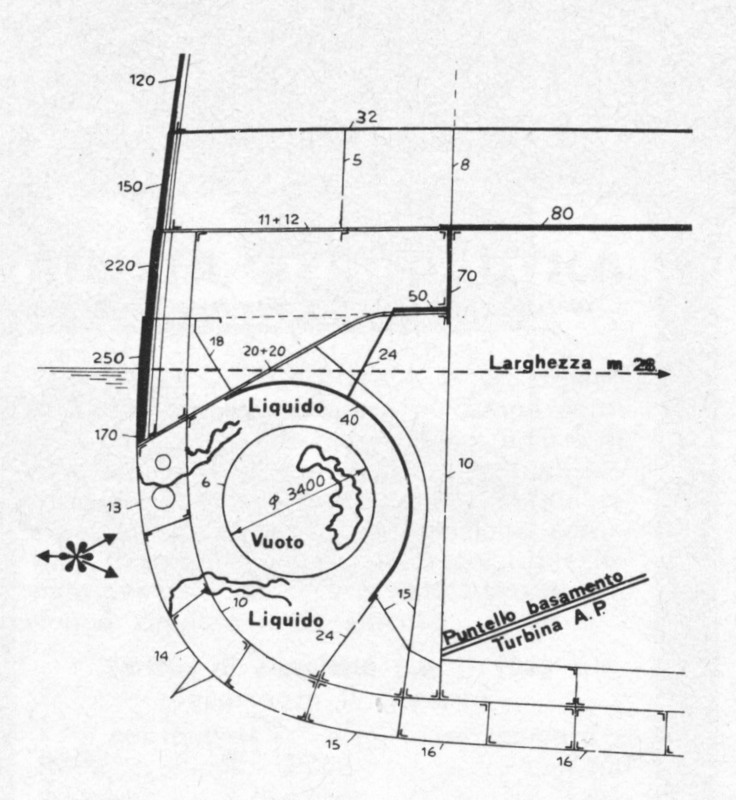 The Pugliese cylinder was found entirely collapsed, while the armored, welded, curved internal bulkhead (40mm, according to the trials made in La Spezia in 1932) was found intact. Rn Giulio Cesare moved to Genoa and repairs lasted 12 days. Complete data on the Pugliese System are given by the extensive tests Kriegsmarine performed on the hull of RN Impero in July, 1944.